All of us must have heard about dual personalities. A term basically used for people who present themselves in one way but they are actually feeling & thinking in some other way. It is always considered the best option to stay away from such people. These dual personalities are portrayed as those who betray, cheat or do back-biting. But, have you ever introspected yourself? Do you present yourself in exactly the same manner as you are? How much you know your ‘own-self’ compared to others around you? How many times you try to contradict your own thoughts? How many times you felt that your sub-conscious is occupied by the thoughts which your conscious had shed off? What I feel is that almost all of us have this dual personality. What we feel & how we react is not always in same line. But, the difference lies in identifying what actually differs in our feelings & our actions? As long as we don’t think any negative like betraying/ cheating others, we consider ourselves clear hearted. But, in defining dual personalities we miss the positive aspect at times. There may be a situation when we hide our true image just because we didn’t felt the need to expose it. People frame opinions with what they see. 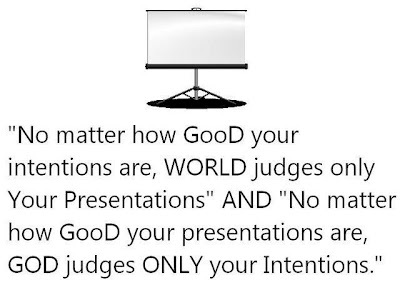 So, it may also happen that you are good but no one realizes this as your casual presentation never reflected what you exactly are? There is always an “Inner Self” in us. This has always remained with you. This is something which knows all about you. Your “Actual” Self…your “True” Self. This is the “True” Self which sometimes contradicts our own decisions. This is the “True” Self that always stays in your “Sub-conscious” mind. But, this is pure, clear & without any fabrication. However, our “Outer Self” is our “Presentable” self. It is fabricated at times depending on circumstances & need of the hour. It is framed by our logical & decisive thinking , by evaluating pros & cons, by analyzing effects & results. Now, the only thing one has to be careful about is the differences between our own Inner & Outer self. More difference results in more conflicts. It results in difference in opinion in our own decisions. It results in our sub-conscious representing our “Inner Self” & conscious representing our “Outer Self”. And last but not the least this becomes the root cause for disturbing our mental peace. So, friends it’s time to introspect & find out if you too have dual personality? If yes, do work out on this and try to minimize it to the best possible extent. BUT YOU LISTEN AND WALK WITH YOUR HEART !! FOR ITS BEST…TO STAY THE WAY YOU ARE !! This entry was posted in Life and tagged Dual Personality, God, Inner Self, Life, opinion, Outer Self, Philosophy, Quotes, Random, Relationships, Thoughts, Values by Akanksha. Bookmark the permalink. more the difference b/w inner and outer self, more will be the conflict. no difference b/w us and the dissociative syndrome. Thanks for posting this fantastic information. Keep up the great job. I’ll subscribe to your weblog also. thnx! It’s so nice to know that you enjoyed reading this and thanks a lot for subscribing. Thanks for reading & sharing your views. I enjoy reading it, nice efforts. God Bless you.. Thanks..for finding it worthy for Reblog !! I am glad to hear you liked it. Thanks. Reblogged this on Go healthy ever after. I see this is an old post but this is what I came upon here. Surprisingly this was the topic of pastor’s sermon this morning but naturally designed along the lines of asking ourselves if our inner Christian selves manifest in the routines of daily living as our outer selves present. I am glad to see your comment here, and to add on I would like to share this is my “Most visited / viewed” post so far. And its a privilege to hear that this is the topic of pastor’s sermon. Thanks a lot for sharing your valuable comment. Its really true Akansha even I also feels like innerself is the most important part if person understand this then he or she can lead a happy lyfe too and I also wanted you to visit my blog too same thinking same perception My blog is salonihumanhood.in please go through it.